After Roy Orbison, George Harrison and Jeff Lynne had a meal together, they decided to come together at Bob Dylan's home studio in Malibu, California, to record an additional track as a B-side for the single release of Harrison's 'This is love'. Harrison had left his guitar at Tom Petty's house, and so he became involved as well. When they'd recorded the song, 'Handle with care', the five decided that it was too good to be used as a B-side, and they enjoyed working together so much that they even decided to record a whole album together. And so the Traveling Wilburys were born. 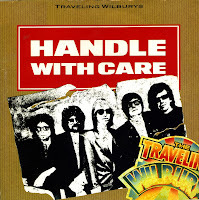 'Handle with care' became the first single from their album 'Volume 1'. It became a hit in various countries including the UK (peaking at number 20) and the Netherlands (peaking at number 24).